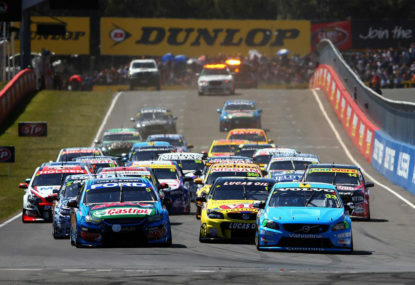 The deal comes as V8 Supercars prepares to drop the ‘V8’ from its name when the Gen2 regulations come into effect. The Gen2 regulations allow multiple engine configurations, making the V8 moniker redundant, although it is likely that most teams will continue to use the current generation V8 engines in 2017. This means that from 2017 it is extremely likely that the category will have Virgin in the name. This will be the first time that a sponsor has had primary naming rights of the category since the days of the Shell Touring Car Championship. In the past the series has had ‘presenting’ deals with XXXX and Bigpond. The news of the Virgin deal comes as V8 Supercars announces a new backer for the series. Red Rooster will become a partner of the series and present the “Red Rooster Super Sprint” at Sydney Motorsport Park later this year. In addition to this, it is believed that V8 Supercars has finalised a deal to return to the middle east. Late last year Dubai Autodrome showed interest in hosting a round at their circuit, and it seems that the Grade 1 Circuit will host a race meeting next year. This will be the second international round that the series will run in 2017, along with the weekend in Kuala Lumpur. V8 Supercars has not yet visited the Dubai Autodrome, although it did race at the neighbouring Yas Marina Circuit several years ago. The series has struggled to maintain an international round, racing in the Middle East, China and the United States. The new Virgin deal is likely to reduce the costs of transportation for the teams, meaning that the series should be able to sustain an international presence. The Dubai Autodrome is a Grade 1 Circuit, meaning that it is able to host Formula 1, although it has yet to do so. In the past it has hosted the now defunct A1GP and FIA GT series, with its largest event being the 24 Hours of Dubai. The deals with Virgin and the Dubai Autodrome are yet to be announced, although the Virgin deal has been confirmed by several team principals to the Gold Coast Bulletin. It is likely that both deals will be announced in July, around the time of the series international foray to Kuala Lumpur.